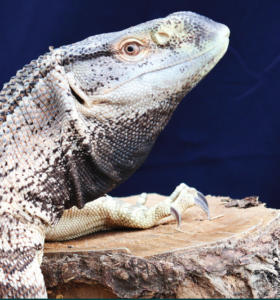 We asked the experts at Q-Mark Pet Products, a licensed distributor and retailer of reptilian pet products, about the dos and don’ts of raising a black throated monitor. The black-throated monitor is a color-morph of the white throated monitor (Varanus albigularis) and is considered a variant of the Cape or Rock Monitor. The black-throated monitor is endemic to Southeastern Africa—more specifically, Tanzania, south of the Sahara Desert. But there’s no need to capture your own monitor in the wild; this particular species has already been bred in captivity, particularly in the United Kingdom. Captive males have been observed to grow 7 feet, while females are just a little smaller in size. Monitors are large, carnivorous lizards with long necks, powerful tails, and muscular limbs; they are also characterized by thick skin, sharp teeth, and recurved claws. The black throated monitor is distinguished by—of course—its dark colored throat, but also by a banded tail, prominent dark stripes on its face and neck, and rows of whitish spots down its spine. In “Keeping and Caring for Monitor Lizards and Tegus (2009),” reptile pet enthusiast Lenny Flank, Jr. notes that some irresponsible pet owners purchase monitor lizards as juveniles, without considering the repercussions of owning large, predatory animals, leaving them ill-kept and unwanted—a situation that could have been easily prevented by doing prior research. DON’T: Treat it like a regular pet. Owners of domesticated animals like cats and dogs often refer to their pets as “fur babies,” and treat them like members of the family. Black throated monitor keepers cannot afford to be as softhearted. “Do not treat it like a dog that you can call or pet at your whim. 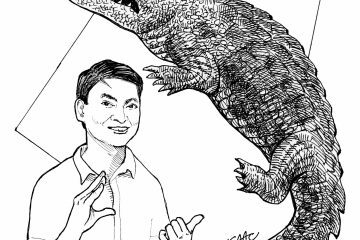 Treat it like the monitor lizard that it is—a big lizard that can deliver a powerful bite, scratch, or tail-whip you if not handled properly. In my opinion, a black throat monitor is a monitor for the more serious and advanced hobbyist,” says our expert from Q-Mark. “They can be defensive when sleeping, but who wants to be disturbed while sleeping anyway? Also, their feeding response is quite strong, so make sure to use tongs when feeding them to avoid the risk of injury.” That being said, Q-Mark notes that this particular monitor possesses a calmer nature, compared to its more aggressive relatives. DO: Make sure you have ample time, space, and facilities for your pet. 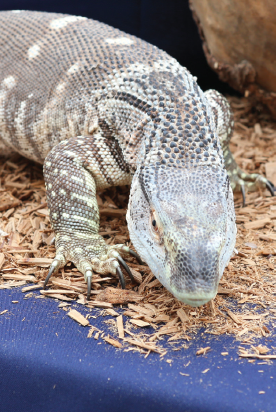 Black throated monitors can live up to twenty-five years, so keeping one as a pet is a long-term commitment. Monitors require spacious, sturdy cages. Flank recommends at least a twenty-gallon sized tank for juveniles, and a specially built cage (with minimum dimensions of 6 ft x 4 ft x 4 ft) for adults. A secure locking lid is absolutely necessary, as monitors are adept leapers and climbers, with adults able to clear three-foot tall barriers! Substrate is used to manage monitor droppings. Q-Mark recommends a mix of ZooMed’s reptibark wood chips and eco earth. Cedar wood shavings must be avoided, says Flank, since cedar wood contains oils toxic to monitors, and shavings produce dust that may irritate their mucous membranes. 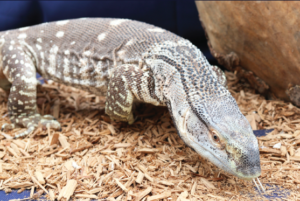 Like all cold-blooded animals, monitors require a regulated temperature system, such as a basking bulb and UV bulb. Q-Mark notes that the ideal temperature range for black throated monitors (130-150 F, with air temperatures from 60-90 F) can be maintained with Zoo Med’s Powersun 100w and Reptisun 5.0, which are readily available in their stores. Speaking of digestion problems, the black-throated monitor has a voracious, carnivorous appetite. “Chicken necks, rodents, big roaches, chicks, and raw eggs are a nice blend,” says our Q-Mark guy. He also recommends dusting their raw feed with vitamins to balance their diet with the required intake of vitamins, minerals, and other nutrients. Overfeeding, naturally, leads to an overweight—even obese—pet, which does not bode well for its health. A handy guide for obesity: check your monitor’s belly. If its belly touches the floor while the monitor is walking, keepers have to start developing a diet and exercise plan. New pets need time to recover from travel and to acclimatize to their surroundings, so for the first few weeks, keepers must refrain from doing anything apart from feeding the monitor. Once it begins to explore its surroundings, taming can begin in earnest; to help your monitor get used to people, keep its cage in an area where it can visibly see people. Handling is a bit more difficult to master, and depends on a caseto-case basis, but owners must be prepared to handle their pets and establish trust for a few minutes daily, until it no longer sees its owner as a threat. Republic Act 9147 or the Wildlife Resources Conservation and Protection Act of 2001 requires owners of exotic pets to register their animals with the Department of Environment and Natural Resources and Biodiversity Management Bureau. The black-throated monitor is classified by the Convention on International Trade in Endangered Species of Wild Fauna and Flora (CITES) as a non-threatened species subject to regulated trade (listed in Appendix II); thus, owners can legally apply for a Certificate of Wildlife Registration at the regional DENR office, assuming that its source has the necessary permits for importing CITES-regulated wildlife. 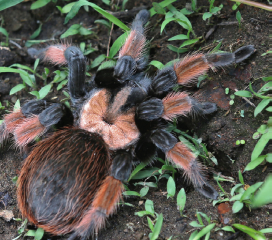 Importing CITES-regulated exotics requires an importation permit, while a Wildlife Local Transport Permit is also required for transporting pets from its local point of origin to final destination. Both applications are processed at the BMB.